Crows are highly intelligent birds, but sometimes their raucous calls, or dominance of the bird feeder may be cause for wanting them to move on. This is a guide about getting rid of crows. 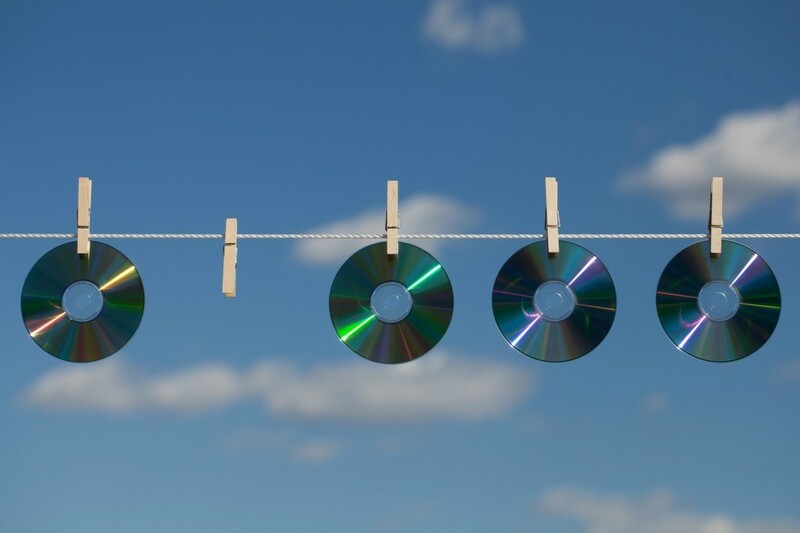 Old CDs or DVDs glinting in the sun make the best bird scarers. What can I do about crows in the trees near my house? I hear them most every morning at about the same time as the blue-jays. They make a god awful sound. It's as if both blue-jays and crows are saying, " get up, get up, we're up, so you should too." Here's some information on getting rid of crows. Farmers have been trying to get rid of them from their gardens for years, hence the use of scare crows. You can also try rubber snakes, but once they realize they are not real, that won't work. Fireworks will work, but often they come back. You did not mention if you were in town or in the country. Some things, can't be done in town, such as the fireworks. Crows and jays are just doing what they are designed to do this time of year-the males make a great noise to tell everyone else they have arrived and "don't mess with us, we are ready for mating!!!" You can shoot large water cannons at the trees, go hunting and other terrible ideas! In short there is very little you can do to prevent the crows and the noise. It is important to remember that crows were here long before we humans invaded their territory. I do not have an answer, but did you know crows are very smart? They are capable of facial recognition and hold grudges so do not be too mean! A largely unknown fact is that crows are very intelligent birds. 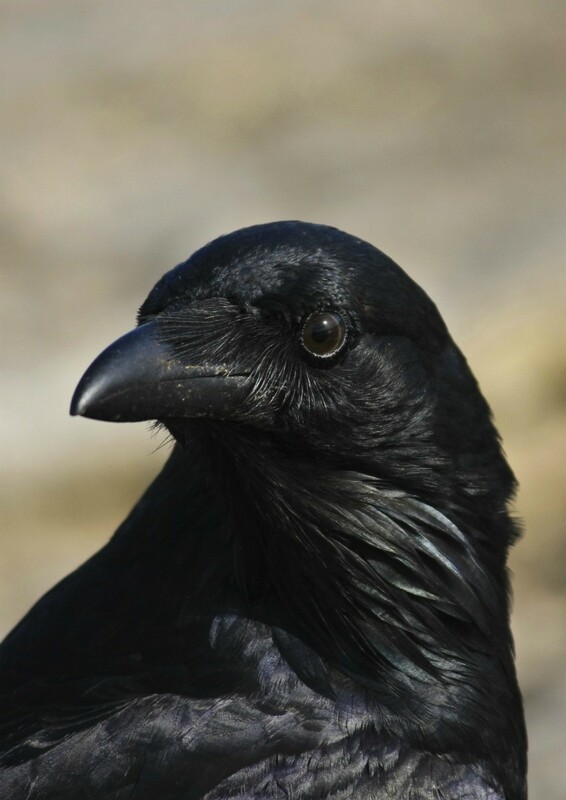 Other than searching for suggestions online to solve your irritation, I suggest looking up the crow as an animal totem. Native Americans believe that animals cross our paths to give us a message. Perhaps changing the way you see your situation and listening to what your message is will better enable you to deal with the problem. We hang cd disc for reflectors and it gets the birds out of our yard. Check out this product. It's a bird repellent tape using holographic colors. It's typically under $10. Target has it for $7. I just now read from the link to Wikihow that bids are not sensitive to ultrasonic sound, so investing in anything subsonic is throwing good money over bad. How can I get rid of black crows? One flew off today with a newly hatched baby duck. We personally hang CD's and Can's as reflection/noise. Here are other tips that might work for you. Make sure you remove all sources of food. This includes bird feeders, pet food, and even compost. Make sure garbage is covered securely. I am from India. I'm being under close attacks by crows in the early mornings. When I come out of my house in the early morning I am attacked by a crow and suddenly a group of crows start to gather around me chirping loudly at the same time. How can I get rid of them? I want to know immediate answers. Thank you. An old Cherokee answer to this is to take a corn on the cob, then take horsehair, wrap the horsehair around the corn on the cob and place it in your yard. WHen the crows come to eat the corn, they will choke on the horsehair. They could be protecting their young, and that's why they are attacking you. Don't walk under any trees. This lasts a couple of weeks. Our oak trees are full of big ugly black crows. Is there any way to get rid of them without scaring off the other birds? The crows are very destructive, tearing up pots of flowers and flower beds, and scaring away the mocking birds and blue jays, not to mention the mess they make of our patio furniture. I don't want to hurt them, I just want them to go away. Crows are intelligent and if one of the flock is hurt at a location, they will leave and never return. You might try a BB gun; that should not hurt them seriously, but give them a sting. Also, if you could net one - throw something over it keep the bird for a couple of days and set it free - might work. Harassment techniques include visual and audio stimuli and an assortment of other approaches to make crows uncomfortable enough to move elsewhere. If possible, act quickly when large numbers of roosting crows are detected. The birds will be more willing to abandon a roost site they have not been using long. Note: Most harassment techniques are effective only for a short time and the public may not like them because they cause crows to move elsewheresuch as a neighborhood park or someones backyard containing large trees. Visual scare devices include Mylar tape, eye-spot balloons, scarecrows, and laser devices. Visual harassment devices can provide effective short-term control, especially when they are used in combination with auditory devices. Audio scare devices include hazing with pyrotechnics such as cracker shells, blanks, propane cannons, and recorded crow distress and warning calls. When using any auditory scare device, change the area from which it is emitted, daily if possible. When using pyrotechnics, try to elevate them above the roost site. Crows scare most easily when they are flying. They are most difficult to scare when perched in the protection of their roost. Therefore, audio devices should begin to be used when the first birds come in to roost, usually an hour and a half before dark. The same group of crows may circle around and come toward the roost many times, so scaring efforts need to continue until it gets dark. Scaring should stop with darkness or the crows will become accustomed to the sounds. If using recorded alarm calls, play them only 10 to 15 seconds per minute when the birds are coming in. When most of the birds are perched, play the call continuously until dark. If possible, early morning scaring should be used in conjunction with evening scaring, and should begin as soon as the first bird movement is detected in the roost, often just before daylight. Success may not be achieved for several nights and will entail continuous efforts every evening and every morning. Because the crows may attempt to establish temporary roosts in other unsuitable locations, scaring efforts may be needed elsewhere until the birds move to an acceptable area. If crows are disturbed in their new roost site they will move back to the old one. Be prepared to resume efforts if they return. Modifying the structure of the crows night roost can discourage the birds from using it. This includes thinning up to 50 percent of the branches of roost trees, or removing trees from dense groves to reduce the availability of perch sites and to open the trees to the weather. A tree service company can remove tree limbs. Before and after pruning of a large coniferous tree and a small deciduous tree to reduce their attractiveness to roosting birds. Other techniques to disperse crows include using 4-inch mesh bird netting to create a barrier between the roost and the crows; spraying crows with water from a high pressure hose (some cities have used a fire hose); installing a 360 degree sprinkler up in the roost tree; and lighting up the interior of the roost with bright fluorescent lights. Most aggressive behavior from birds is motivated by defense of their territory or young, or their search for handouts. Hummingbirds have been noted to buzz people wearing red, perhaps thinking that they were a group of nectar-rich flowers. Pigeons and swallows may appear to be attacking humans when actually they are returning to their nests in the eaves of buildings. When possible, stay away from nesting areas with aggressive birds until the young are flying (three to four weeks after eggs hatch) and the parents are no longer so protective. (Do not attempt to rescue chicks found outside nests when adult birds are calling loudly nearbysee Baby Birds Out of the Nest for information.) If you must walk past a nest, wave your arms slowly overhead to keep the birds at a distance. Other protective actions include wearing a hat or helmet, or carrying an umbrella. 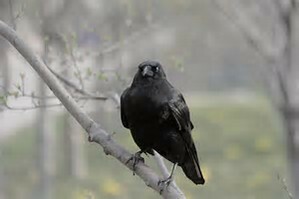 Although health risks from birds are often exaggerated, large populations of roosting crows may present risks of disease to people nearby. The most serious health risks are from disease organisms growing in accumulations of droppings, feathers, and debris under a roost. This is most likely to occur if roosts have been active for years. Precautions need to be taken when working around large concentrations of crow droppings. Call your local Public Health office for information. At the time of writing, West Nile virus, a virus carried by mosquitoes, has killed thousands of crows in the Northeast, Southeast, and Midwest portions of the United States. Call your local Public Health office updated information. Always wear gloves when handling dead or live birds. How do you get them to go away? I feed the birds, but the crows seem to take over the bird feeder. I see them throwing the seeds on the ground and eating the good stuff. I don't mind feeding the crows, but how can I stop them from taking over? Since the answer may be location specific, I'll say I live in a suburb of Washington, DC. I had the same problem with crows monopolizing my feeders filled with sunflower seed and mixed bird seed. I switched to safflower and nyjer seed and the crows left. When I added feeders with suet and sunflower seed to those with safflower and nyjer seed, the crows came back. I plan to switch back to just safflower and nyjer seed next. If you don't want birds in your garden, especially if you have fruit trees, CDs can provide a bright flash that many birds avoid. Using CDs to keep birds out of your garden is a common and effective practice.